This definitely was the most bizarre thing I tried in the name of beauty. It might sound a bit odd and scary but it really is not. It was actually ticklish and I giggled for most of the procedure. After a little while you get use to it and the novelty and your dry skin starts to go away. I had mine done while in Singapore at Fish Reflexology on Sentosa Island although the spa therapy was first discovered in the Middle East. 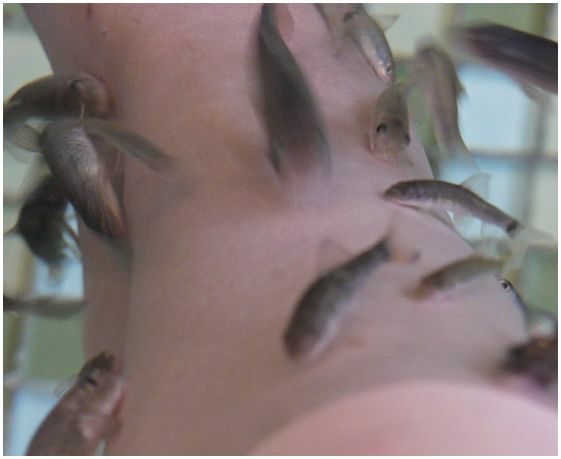 Fish Reflexology uses Turkish Garra Ruffa species native to hot springs, lakes and river basins. Fish foot spa pedicure is done by dozens of tiny fish nibbling on your dead skin. 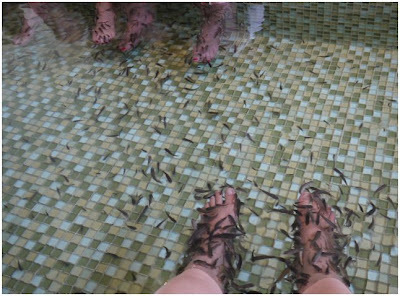 There are some strict rules about fish foot pedicures to protect yourself and I suppose the fish too. The Fish Reflexology Spa was so beautiful and relaxing with sounds of a bubbling brook playing in the background. Everything was so clean and decorated in neutral colours. So, after my preparations were done I chose to go in to the water pool with smaller fish (as I was a novice to this kind of nibbling). As soon as I dipped my feet into the warm water pool dozens of little mouths, like little suction pads headed for my feet. Looking down I saw a swarm covering everything below the ankles. It looked amazing and felt so funny and I could not stop staring at my feet. Some of the little fish went between my toes as well and that just made me laugh out louder. Looking around me I saw other people going through the same kind of thing giggling and taking pictures too. My experience of the fish pedicure was unforgettable. I really enjoyed myself and my feet were baby soft and pampered. Have you tried it yet? What was your experience like?